Residents of a community in Beauce suspect their water supply has been contaminated, with several residents hospitalized with symptoms of gastrointestinal illnesses. A boil-water advisory has been in effect in Saint-Bernard, 50 kilometres south of Quebec City, since Tuesday. Last week, Quebec’s public health department released a notice that a strain of illness-causing bacteria in the town’s water supply. It said several cases of infection related to the campylobacter bacteria were reported in the municipality starting on July 13. “Essentially campylobacter causes gastroenteritis, so you can have diarrhea, strong abdominal pains,” said Charles Dozois of the National Institute of Scientific Research (INRS). 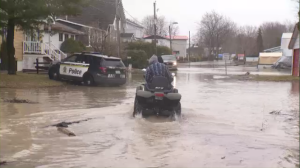 Andre Gagnon, mayor of the town of 2,300 people, said that so far, there are 20 confirmed cases of illness, and five of those had to be hospitalized with several of them being more serious symptoms. Thus far, health officials have been unable to find the source of the bacteria. “All the tests have come back negative,” he said. It’s so far unclear when the advisory will be lifted. Residents are being told to use boiled water or bottled water for routine tasks such as preparing baby food, washing fruits and vegetables, making ice and brushing their teeth. The environment and agriculture ministries are working with the municipality to investigate while the regional health agency keeps people updated.